Summer 2018 has already been a scorcher. Staying hydrated is important all year round, but when the temperatures pick up, so does the risk of sun stroke, dehydration, and a whole variety of health issues that can arise from not hydrating your body properly. This issue is a particular concern in the healthcare and geriatric care industry. Assisted living facilities and rehab centers are tasked with ensuring that all residents are properly hydrated at all times. A challenging undertaking, but the risks of being “sloppy” in this area can be life-threatening. 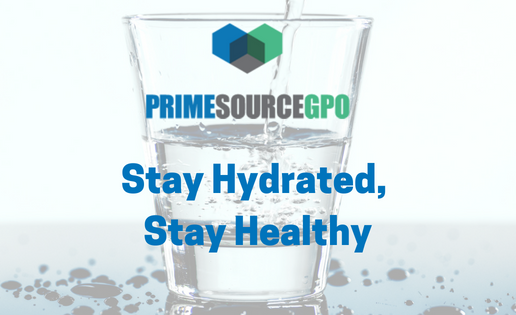 Prime Source GPO is proud to partner with a variety of vendors that specialize in ensuring the continued health and happiness of your facility’s residents, including Multi-Flow, a beverage service solutions supplier and Prime Source GPO Partnered Vendor. Our business was founded by Samuel Gottlieb in 1937: our company has been serving top quality beverages for over 80 years. Mr. Gottlieb saw an opportunity opening in the growing dispenser realm and so he parlayed it from a repair/servicing operation to a full-fledged beverage manufacturer. In a nutshell, Multiflow Beverages offers complete product production, equipment, and servicing of beverage dispensers. We offer a unique one-stop-shop for your dispensers, products, and servicing needs, unlike other brands that offer only a piece of the process. The beverage dispensing industry can be tricky: cost containment is a challenge for all parties, from the healthcare facilities looking to install our products, to the manufacturers of the machinery that’s looking to control production costs. What we do is work with both ends to find a profitable solution for all parties! Our “Kickoff Process” for utilizing our services is fairly simple: First, we analyze your facility/business/company needs, and present a customized solution. We recommend the appropriate products and machinery, and install all equipment Our customer service team follows up with your managers to answer any questions regarding the operation and maintenance of the equipment. What sets Multiflow Beverages apart is our thorough understanding and respect of our customers. Too many beverage service providers take customers for granted, and fail to respond to customer needs and concerns. Because customer satisfaction is our key priority, we preempt any issues by staying communicative and responsive to any feedback. We hold ourselves to this impeccable standard of customer care by consistently adhering to our core values: Service, Integrity, and Progress (or “SIP”, as it’s known to our employees). We would love the opportunity to present our program with all Prime Source GPO members: let us help you lower your food and beverage costs – forever! Prime Source GPO partners with hundreds of passionate, diverse, and top-quality vendors across a wide spectrum of industries and products. Get to know each of our vendors through the Prime Source GPO blog, or follow us on social media!